Discover the science of restoration and witness the incredible perspective of master art restorers as you step into a workshop where expert artisans are breathing new life into works of art, both traditional and contemporary. courtesy of: Banco BPM Cabinet The restoration of this coin cabinet aimed to recover the aesthetics of its external surface, which had undergone a clumsy previous restoration. All the locks were completely blocked. This late 16th century Baroque-style monetiere (Coin cabinet) has ebony veneer along the edges and is extravagantly decorated with golden copper and coral. The cabinet is topped with a two-tier domed structure set on top of a cornice supported by columns. Classical shaped vases and obelisk finials flank these columns. 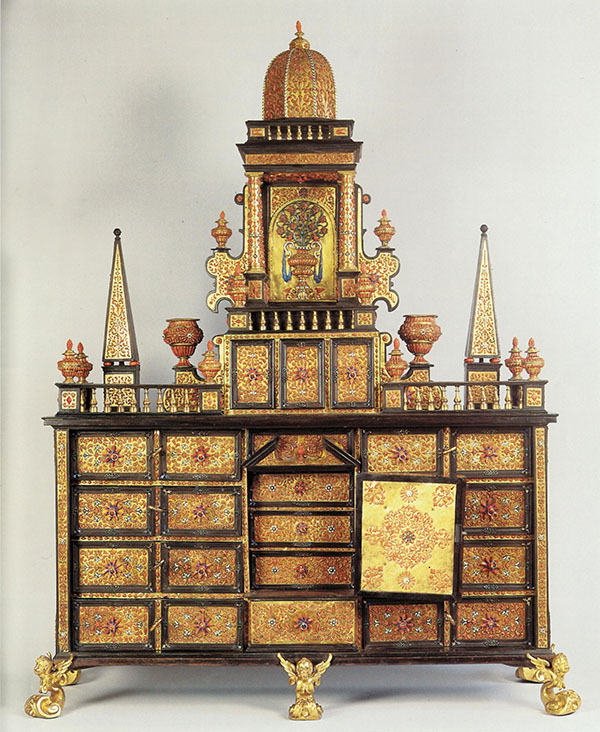 Below, eight drawers are arranged in symmetrical blocks inlaid with rich gold copper and coral floral decoration. The drawers surround a kiosk door. The architectural design of this central niche is covered in enamel and coral and decorated with a flowerpot set under a broken pediment. The cabinet sits on gilded bronze feet in the shape of winged cherubs. The metallic decorations with enamel and coral encrustations, fixed to the surface using a sewing technique, were taken apart to clean their external surfaces, remove dirt deposits and regenerate the current paint. The threads were then fixed back on to the support by gluing and pulling with small clamps. The small gaps and cracks in the veneer were filled in with a gypsum-based dyed stucco. The cabinet was then polished with buffer shellac until a brilliant finish was achieved. The locks were unblocked. Open Care is the only company in Italy offering integrated services for the conservation, management and valorisation of art works and collections. It has vaults, exhibition spaces and workshops for the restoration of artworks of any kind, technique and period and has a network of consultants with the specific expertise for the valuation of collectibles and assistance in purchases and sales of artworks and collections. Within the context of Open Care, which is the site of archives for artists, foundations and art galleries and a residence for artists, art collectors and operators in the art system can find the spaces for, and assistance with, the exhibiting of artworks and collections and for the promotion of projects and events aimed at their valorisation. Open Care is controlled by Bastogi Spa, founded in 1862 and the oldest Italian company that is still active and listed on the Italian Stock Exchange. Emiliana Bianchi was born in 1977. She acquired her postgraduate certificate in woodworking and maintenance techniques of wood materials at the Italian Academy of Restoration in Milan in 2003. After working on a number of restoration sites, she started working in Open Care's furniture restoration laboratory in 2005. She has participated in restoration works for the FAI, the Castello Sforzesco and the Braidense Library. Giuseppe Degennaro was born in 1969. He has a degree in economics and commerce from the University of Nancy II in France and a diploma in restoration of wood at the Italian Academy of Restoration, Milan. Giuseppe has worked at Open Care since 2004. He later became head of the wood furniture conservation and restoration workshop. Giuseppe has carried out restoration work for the Sforzesco Castle, the Braidense Library, the Poldi Pezzoli Museum, the Bagatti Valsecchi Museum, the Italian Environment Fund, the Querini Stampalia Foundation in Venice, and the Palazzo Mocenigo Museum in Venice. courtesy of: Galleria Giorgio Franchetti alla Ca’ D’Oro - Venice Tapestry The "Holbein" carpet presented a deposit of dust on the entire surface that blurred the colours and the brightness of the fleece and dehydrated the fibres. In addition, three liners that had been inappropriately fixed to the back of the carpet prevented it from resting correctly on the ground. This caused various harmful undulations and tensions. The solid blue patterns surrounded by classical decoration of two intertwined motifs, the border design as well as the great refinement with which this “Holbein” carpet was woven, place it within the second half of the 15th century. 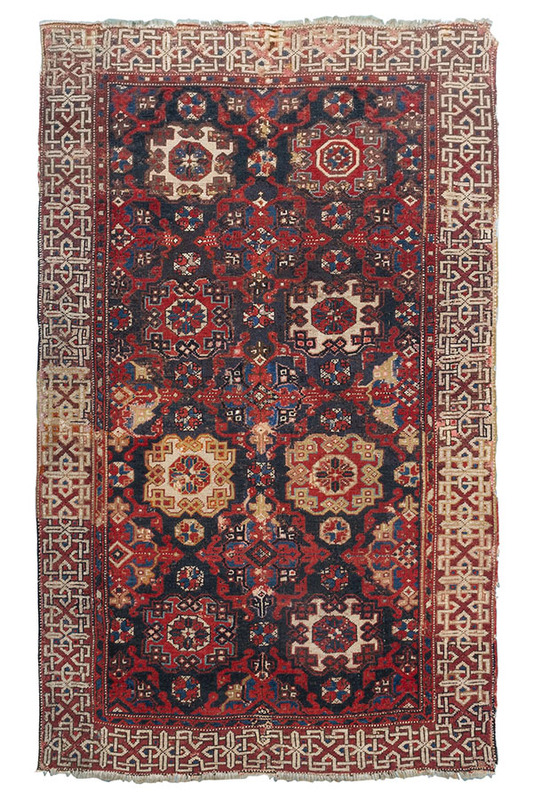 Four rows of lozenges, crosses and octagonal designs decorate the surface of this predominantly dark-red carpet produced in western Turkey. Yellow-gold hues emerge from below the red. The lining was completely removed and the most fragile areas consolidated. Examinations to test the stability of the yarn were carried out, then the carpet was washed. Damaged areas on the border of the carpet were sewn with an invisible seam. The colour of the yarn used in the extended restoration was changed over time to much clearer shades. In order to increase the visibility of the decoration it was decided to intervene by means of a pictorial retouch on the bottom part of the blue field. The intervention achieved is reversible. The carpet has been placed on the display frame, fixing it with seams along the perimetre and in the field in order to distribute the weight and tensions adequately. M. Elena Paola was born in 1978 in Savona, Italy. Elena worked from 2002 to 2009 at the Arazzi Restoration Laboratory of the Opificio delle Pietre Dure in Florence and obtained her diploma in restoration techniques from the ENAIP School of Botticino, Brescia. Elena has been working with Open Care as a restorer of antique textiles, tapestries and carpets since 2010. The textile restoration laboratory regularly collaborates with museums, private and public bodies and collectors. M. Elena Paola has worked on restorations for institutions such as the Galleria Franchetti at the Ca’ d'Oro in Venice, the Uffizi Gallery in Florence, the Poldi Pezzoli Museum and the Diocesan Museum in Milan. courtesy of: Private collection Easel painting The white surface was dusty and stained. The perspective shadows contrast with the direction of the normal light sources, creating a disorienting effect. This approach breaks from traditional pictorial standards. In fact, if during the history of art we have always studied perspective to create a realistic pictorial effect, Agostino Bonalumi flips it, or distorts it, by creating his own personal "point of view". The intervention was focused on cleaning the white, delicate and thin surface. The difficulty was to remove stains and dirt from a white paint that could not bear solvents or water. This was done using a new generation cleaning approach called dry cleaning, which uses particular rubbers and foams. Born in Turin in 1991, Chiara Santhià obtained a Master's degree in conservation and restoration of cultural heritage at the University of Turin in collaboration with the La Venaria Reale Conservation and Restoration Centre. Since her first year of university, Chiara has undertaken internships in different areas related to the restoration of artistic heritage, including at the PLART Foundation of Naples, the Sandretto Re Rebaudengo Foundation of Turin, the Stupinigi Hunting Hall, the earthquake deposit of works at the Doge's Palace in Sassuolo and Palazzo Litta in Milan. She collaborated in the design and implementation of interventions and tutoring for the Varallo Sesia Civic Art Gallery, the Museo del Novecento in Milan and important private collections. Chiara has worked at Open Care since October 2017, in the conservation and restoration laboratory for open-ended paintings. Agostino Bonalumi (1935 – 2013) was an Italian painter and sculptor. He completed his studies in technical and mechanical drawing. 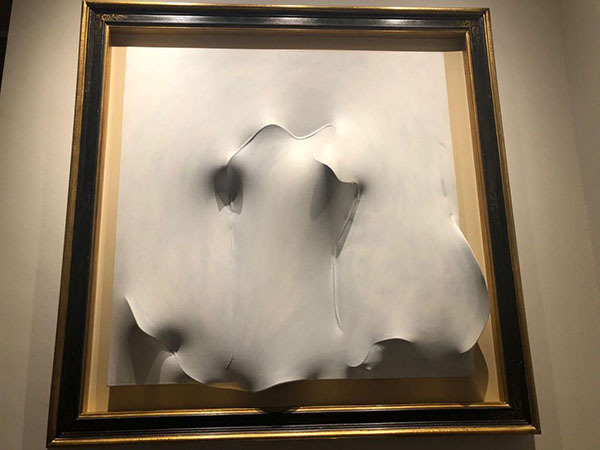 He started to exhibit his works at a very young age, and from the 1950s started to attend the studio of Enrico Baj, where he would meet Enrico Castellani, Lucio Fontana and Piero Manzoni. He worked with the Azimuth Magazine, which advocated the total elimination of previous artistic experience in favour of a new beginning based on the impact of social progress. The idea to go beyond the canvas was introduced to him by his mentor Lucio Fontana, who, along with Manzoni and Castellani, created monochrome canvases (often white) extruded with various techniques in order to create lighting effects and changing shadows. The work of Bonalumi is considered by many critics to be extremely imaginative and always novel in the creation of new and original light and shadow games. courtesy of: Fondazione Giorgio Cini - Venice Tapestry A large powdery deposit has accumulated on the surface of the tapestry. Above all, the area of what should be bright sky is now going grey. The fibres of the tapestry are also slightly dehydrated. The weaving cuts have been weakened, especially in the upper part, which mostly supports the weight of the tapestry. These seams must be restored and checked in order to avoid the formation of gaps and tensions on the surface. This tapestry was woven in Brussels towards the end of the 16th century in the workshop of Franz Geubels. It is part of a series of four recounting the story of Roman general Scipio Africanus. 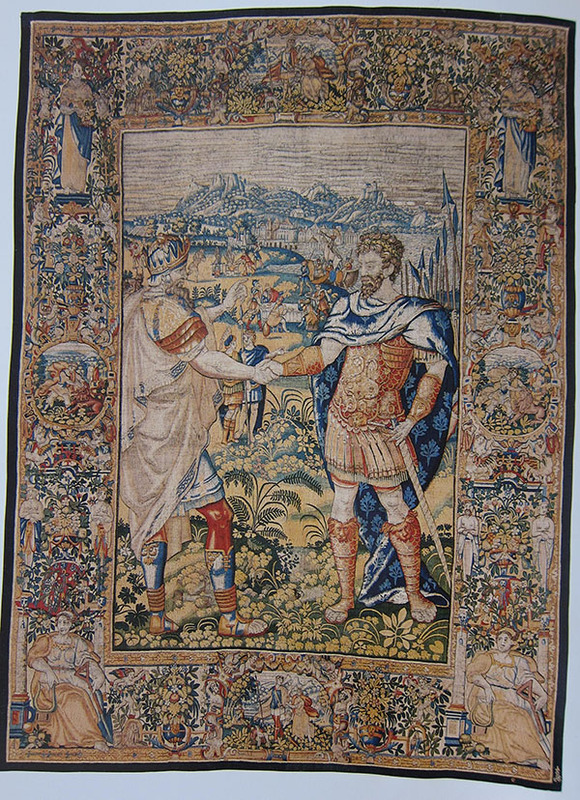 This tapestry depicts Scipio concluding an alliance with Siface, king of the Massili. Scipio (right) shakes hands with the crowned king of the Massili (on the left). Soldiers and military apparel can be seen in the background as well as countryside and a city, Citra, the capital of the numinous kingdoms of Siface. The borders of the tapestries depict mythological scenes from Orpheus, Hercules, Venus and Adonis. The series was restored between 1998 and 1999. During the restoration, the dust deposit on the front and back of the tapestry will be removed using a museum vacuum cleaner. Using a protective net and micro-nozzles, restorers will review the weaving and consolidate weakened or patchy areas. Then the lining and the suspension system will be checked, and any missing seams restored. Born in 1978, Milena Gigante holds a master's degree in history of art and conservation of artistic heritage from the Ca’ Foscari University of Venice, a second degree in conservation of cultural heritage at the University of Pisa, as well as a diploma qualifying her as a technician for restoration, obtained at the ENAIP school in Botticino, Brescia. Milena has worked with Open Care since 2004, as restorer of antique textiles, tapestries and carpets. In 2011, she took over the technical management of the textile restoration laboratory, which collaborates on a permanent basis with museums and public and private institutions. Among others, Milena has carried out restoration work for the Uffizi Gallery in Florence, the Ratti Foundation in Como, the Querini Stampalia Foundation in Venice, Palazzo Madama in Turin and the Teatro alla Scala Foundation. 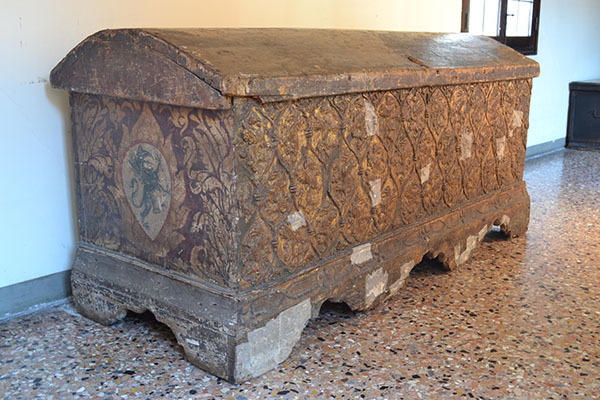 courtesy of: Fondazione Giorgio Cini - Venezia Chest There are several gaps in the rich decoration, which shows the heraldic coat of arms of the Martelli family. The gilding still present is veiled by a thick layer of various different deposits. The main problem is the adhesion of the pastille decoration to the wood. The surface of this solid poplar cassone (marriage chest), has been intricately decorated with an Italian technique of low relief work known as Pastiglia. The motif of the griffin is repeated on the front. Only one fragment of the original pictorial decoration of the lid survives. The sides bear the noble coats of arms of the two families united in marriage, the back a decoration imitating a brocade fabric. Preparatory layers and the paint film on the side of the work will be consolidated. The consolidating agent will be chosen during the course of the work following tests carried out using traditional and synthetic products. Incoherent deposits will then be removed with brushes and micro-vacuum cleaners with variable power. Strips of the same wood species will be inserted and the hinges checked in order to consolidate the structural support, as well as the restoration of the cracks, wooden gaps and connection points. The gaps will be grouted with a chalky preparation. After restoring the gilding, a protective varnish will be applied. Simona Maria Tavella was born in Milan in 1978. She obtained a diploma as a restoration technician at the Italian Academy of Restoration / Milan Art and from 2002 to 2008 worked intensely as a gilder for a number of important restoration studios. In 2008, she obtained a certificate as a restoration operator qualified to use laser equipment, and also attended a specialisation course in gilding in Florence at the studio of masters Carlo and Stefania Martelli. She has worked at Open Care since 2008 as a restorer in the department of paintings on canvas, table and mixed media artworks. Simona has carried out several restorations for important private collections, banking institutions and religious structures. She has also collaborated with foundations including the Trussardi Foundation and the Prada Foundation. courtesy of: Museo dell’Arredo Contemporaneo - Ravenna Plastic sculpture Atmospheric and solar exposure has caused serious damage to the work. Bubbling on the green surface is attributable to a number of factors such as defects or impurities that occurred during the extrusion process or external causes such as exposure to unfavourable climatic conditions. The general surface of the foot has been altered, affected by conspicuous deposits of sticky material, mixed with dust. Scratches and cracks are widespread throughout the work. 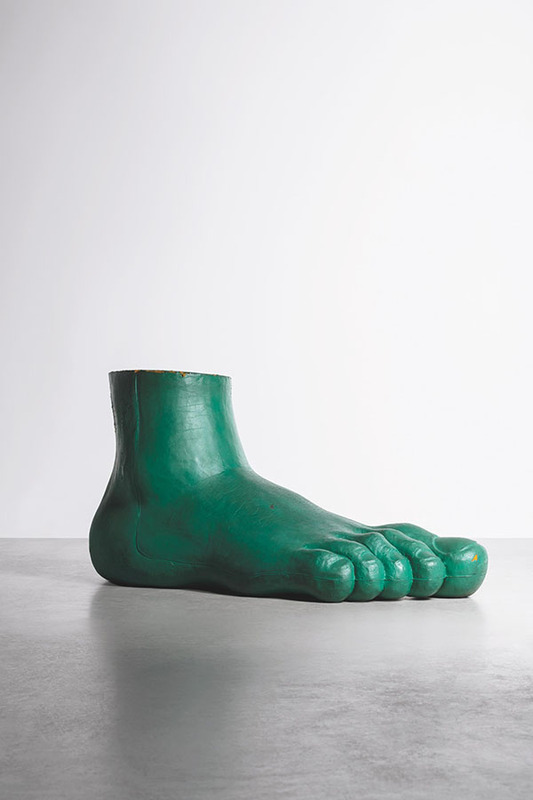 This giant polyurethane foam foot finished with green patent leather was designed by Gaetano Pesce in 1969. The foot is part of a series called Piede produced between 1975 to 2005 by B&B Italia and is one of the company’s iconic creations. This foot is actually a lounge chair and part of Gaetano Pesce’s UP7 series of “transformation” furniture. Resembling a classical sculpture of a bronze foot, it celebrates both modern design and classical Italian sculpture. The work, which was already in a poor state of conservation due to unsuitable packaging, remained attached to the cardboard, creating a series of lacerations and gaps in the material. The polyurethane foam is particularly problematic for conservation. A consolidation method based on liquid polyurethane was applied to the clouding on the surface. For this restoration, Open Care experimented with nanopolymers. Following a dry cleaning with a specific rubber and a surface cleaning carried out after laboratory tests, Open Care will consolidate the foam rubber with a polyurethane resin. Where it is possible to join the margins of the tears, these points will be glued using a non-ionic aqueous dispersion. The cracks will be grouted with a synthetic material applied with a spatula to the surface in order to imitate the original texture. The pictorial reintegration will be carried out later with materials tested during the intervention. Enrica Cabianca was born in Verona in 1980. She obtained a diploma as a technician operator of conservation and maintenance of works of art, with a specialisation in canvas paintings and tables, at the Santa Paola Institute of Mantua. From 2002 to 2008, Enrica worked as a restorer of canvas paintings and wooden sculptures in numerous private laboratories in Veneto. She developed a preparation for the restoration of plastic materials (synthetic polymers) at Open Care, where she has worked since 2008 as a restorer in the department of canvas paintings, table and mixed media artworks. She has carried out restoration works for the Museo della Scala, the Pinacoteca di Brera, the Castello Sforzesco, the Catholic University and the Theological Faculty of Milan, as well as the Museo del Novecento and the GAM. Chiara Centemero was born in 1993 in Segrate, Italy. Chiara currently works as a specialist at Open Care. The subject of her thesis is the restoration of a work by Piero Gilardi made in expanded polyurethane, for which she will use a consolidation method involving polyurethane based Nano polymer, an experiment that is supported by the Italian government. Chiara has worked at Open Care as an intern multiple times since 2006. In addition she also completed several extra-curricular internships at a construction site in Villa Olmo, Como, and in the paintings laboratory of the Academy of Fine Arts "Aldo Galli". The latter collaborates with individuals, religious institutions and museums. Chiara is passionate about contemporary art. Born in 1975 in Milan, Chiara Fiegl graduated as a technical operator in the conservation and maintenance of art works from the Aldo Galli Academy in Como. From 1996 to 1998, she worked intensively on a construction site, engaging in the restoration of wall paintings, frescoes and stone materials. From 1998 to 2006, she worked as a restorer of ancient and contemporary paintings in important private laboratories. Since 2006 Chiara has worked with Open Care as a restorer in the department of paintings on canvas, table and mixed media artworks, and has carried out numerous restoration interventions for important private collections, banking institutions and religious organisations. Born in La Spezia in 1939, Gaetano Pesce is an Italian architect, painter, designer, sculptor and philosopher and a pioneer of Italian design in the postwar era. Pesce studied architecture at the University of Venice and during his early career was a member of Gruppo N, an architectural collective strongly influenced by the Bauhaus movement. During the 1950s, he worked as an architect, urban planner and industrial designer. From the 1960s, he researched the function and form of utilitarian objects such as furniture and jewellery, inspired by studies on human emotions and perception, resulting in an avant-garde style. Bold and strong use of colours and innovative use of materials characterise Pesce's works. courtesy of: Fondation Cartier pour l’art contemporain - Paris Furniture Wood fluctuates in size when the temperature and relative humidity change. For this reason, there are cracks in the wood and the decorative layers on both the console and the blade. On the surface of the blade, the wood joins are also marked. At various points, the gilding has been worn out in such a manner that the dark red primer used to prepare the surface is showing. The upper part of the console is designed to contain a coloured liquid, which has stained the tank in which it was contained. The installation consists of a console and a long blade. Both objects have been decorated by covering them first with a dark red bole and then with gold leaf, according to the ancient technique of gilding. 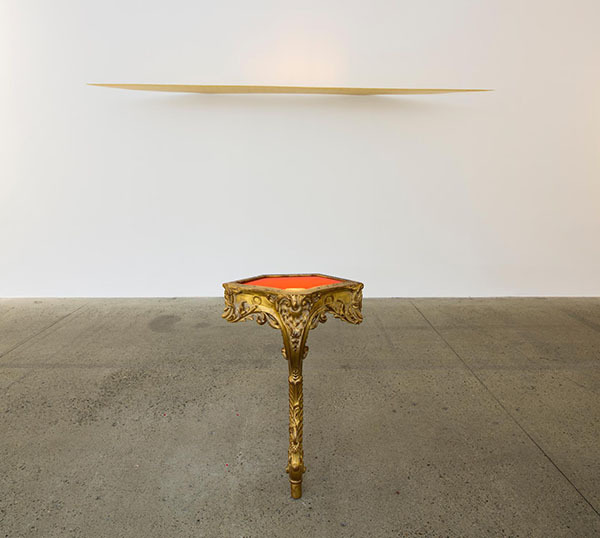 The two angles of this Louis XV style gilt-wood console table would normally be resting on two wall corners. However, the console here seems to levitate from its one leg in the middle of the exhibition space. The golden surface will be cleaned while the lifting and cracking of the wood will be consolidated using a resin, controlled pressure on the treated areas and microinjections. The gaps will be grouted with resin and finally gold leaf will be applied to the surface where needed. Born in Monza in 1976, Paola Pirovano obtained a diploma in conservation and art restoration theory and a diploma in methodologies and scientific techniques for restoration, specialising in paintings, tables and frescoes, at the International University of Art in Florence. From 1998 to 2003, Paola worked intensively on the construction site in Florence, engaging in the restoration of wall paintings and frescoes protected by the Ministry for Cultural Heritage and Activities. Since 2004 she has worked with Open Care as a restorer in the department of paintings on canvas, table and mixed media artworks, and has conducted numerous restoration interventions for important private collections, banking institutions and religious organisations. Marc Couturier was born in 1946 in Mirebeau-sur-Bèze, Burgundy. Marc is a self-taught artist who started his career at the age of 38. He exhibited his first work in the Biennal of Belfort in 1985, but it was not until the exhibition Les Magiciens de la Terre held in the Centre Pompidou in Paris in 1989 that he received widespread recognition. Marc distinguished himself with his series of boats, Barque de Saône, installed in such a way that they seem to levitate from the ground. This gravity defying illusion can be found in a number of his sculptural installations. He has adapted this technique for a number of surfaces, from modest sheets of paper to large murals set in museums. courtesy of: Gallerie dell’Accademia – Venezia Paintings The two monochromes, inserted in gilded wooden frames, are in a fairly good state, however there is a series of problems caused both by the natural degradation of the constituent materials and by the many restoration interventions that have taken place over the years. The two works under restoration, painted on canvas by Paolo Veronese, depict the prophets Isaiah and Ezekiel standing on two bases decorated with leonine heads. The majesty of the figures is in keeping with the artistic production of religious tradition linked to Paolo Veronese. The works will be removed from their original frames and their backs will be cleaned using micro-suction and brushes. The restorer will proceed with a dry cleaning of the surface with sponges or rubbers, and will then map the surface areas affected by crimping and lifting. These will then be consolidated with microinjection. Oxidised paint will need to be completely removed. In this case, the most appropriate solvent will be selected following cleaning tests determined by the Wolbers solubility test. During the cleaning, previous pictorial alterations that either altered and/or overlapped the original colour will be removed, while an evaluation will be made about whether to retain or remove any well-executed interventions. Previous repairs will be either removed or improved by imitating the original material. Small and medium deformations will be smoothed with a magnetic gel-like system, and finally the chromatic reintegration of the painting and the improvement of previous restoration touches will be carried out. The reintegration will be performed with watercolour. The final operation will be to put the paintings back in their frames. Federica Salvioni was born in Monza in 1975. She has worked with Open Care since 2004 as a restorer in the department of easel painting, table and poly-material works. Federica obtained a diploma as a technical operator in restoration work and specialised as a restorer of wall paintings at the Enaip school in Botticino, Brescia. From 1996 to 2004, she worked intensively on construction sites, working on the restoration of wall paintings and frescoes and works protected by the Ministry for Cultural Heritage and Activities. Federica has led numerous restoration interventions for private collections, banking institutions and religious bodies. Among them, La Scala Theatre Museum, the Faculty of Theology at the Catholic University of Milan, as well as the Museo del Novecento. Paolo Caliari, known as Paolo Veronese (1528-1588), was an acclaimed painter active in Veneto in the 16th century, best known for his historical, mythological and religious subjects. Along with Titian and Tintoretto, Veronese is one of the three great painters that dominated Venetian painting in the 16th century. His elaborate narrative cycles are among the most famous of Veronese’s paintings. These were painted in a colourful and theatrical style and depicted opulent scenes of pageantry and architecture. His paintings of biblical scenes, painted in monasteries in his native Verona as well as in Venice, are also among his key works. courtesy of: Fondazione Gianfranco Ferré Dress A first observation reveals a slight yellowing of the fabric, generated by the natural oxidation of the fibres, as well as a light powdery deposit on the surface. The inner layers of the dress do not show signs of deterioration. The outer layer, on the other hand, shows some problems arising from repeated use of the dress, given the extreme delicacy of the fabric. The dress will be micro-suctioned to remove powdery deposits. The restorer will then proceed with a localised cleaning with volatile and non-volatile solvents to lighten or remove deposits and stains. Once the cleaning has been completed, tear reinforcement operations will be carried out by inserting small dyed silk crepeline supports. The garment's seams will be restored where weakened and the dress will be steam-cleaned to give the fibres hydration and elasticity and to remove the folds. Gianfranco Ferré (1944 -2007) was an Italian fashion designer nicknamed the “architect of fashion” for his avant-garde contributions to the fashion world. He started his career in the fashion world by designing accessories. After working as a raincoat designer, he opened his own company, Baila, in 1974. He started by launching a women’s collection in 1978 and his first collection for men was launched in 1982. 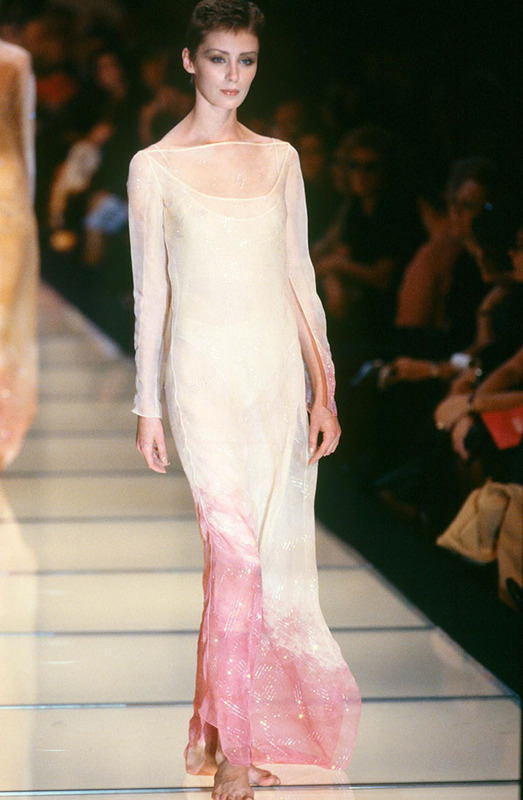 In 1989, he was appointed stylistic director at Christian Dior in Paris. Ferré managed both his own company and his position at Dior by working between Milan and Paris.